Easter was action-packed! The Hall Society elected a new committee after a well-attended AGM, the Beach Boys won the cricket, elaeagnus got chopped down, new babies appeared, the jetty was jumped off, ORRA celebrated some successful fundraising results and we enjoyed spectacularly still autumn weather. The Easter 2015 Weedbusting Working Bee was attended by 40 people, a fantastic turnout, we love you all. 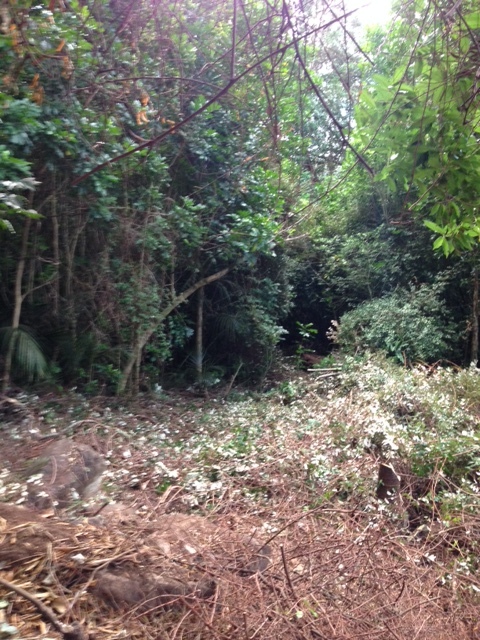 With a new brush cutter and several chainsaws roaring, people scrambling underneath huge elaeagnus trees and a small army chopping away with loppers we cleared just under 1000m2 in 2.5 hours. We had new tools and a box of poison paste (courtesy of a Department of Conservation grant) and lots of safety gear for everyone. Looking at a photograph it’s hard to really appreciate the impact that our working bees are making in the forest behind the YHA. If you are sure-footed it is well worth the effort of diverting uphill from the YHA Nature Walk. 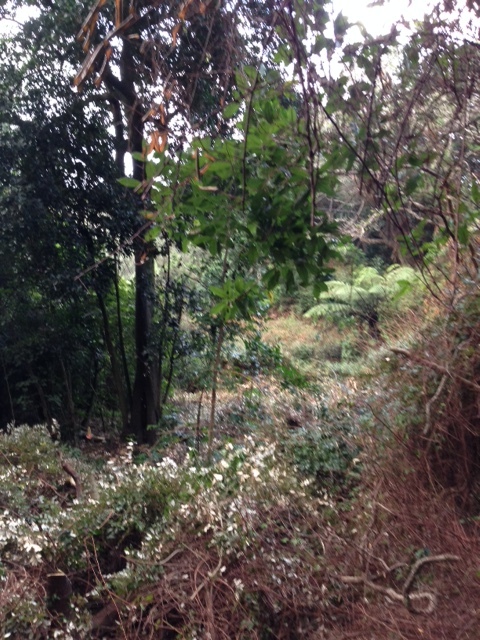 Clamber over some loose boulders, negotiate the old boundary fence and then marvel at the lovely coastal broadleaf forest that surrounds the base of Maungaruawahine. 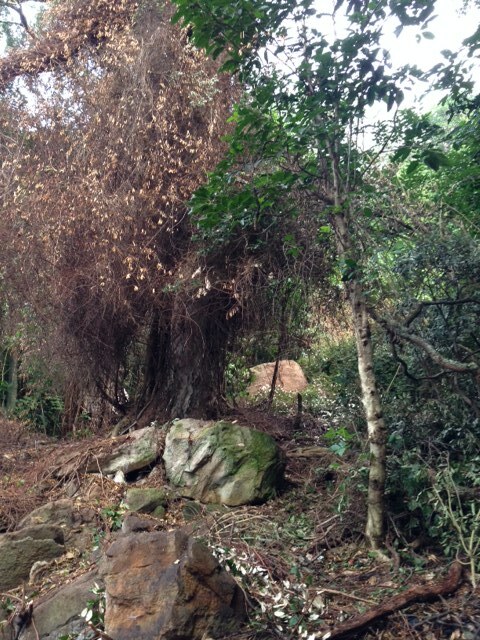 Increasingly free of the elaeagnus that threatens to smother it the forest now has the chance to regenerate, thanks to the blood, sweat and tears (of joy..!) of our Weedbusting Working Bee volunteers. Keep your eyes peeled for the next chance to get involved, we hope to hold regular working bees over the coming months and will share details on this website and in notices distributed about the village. You can also contact us on our Get Involved page. ORRA would also like to recognise the fundraising efforts of committee member Rachel Lang. 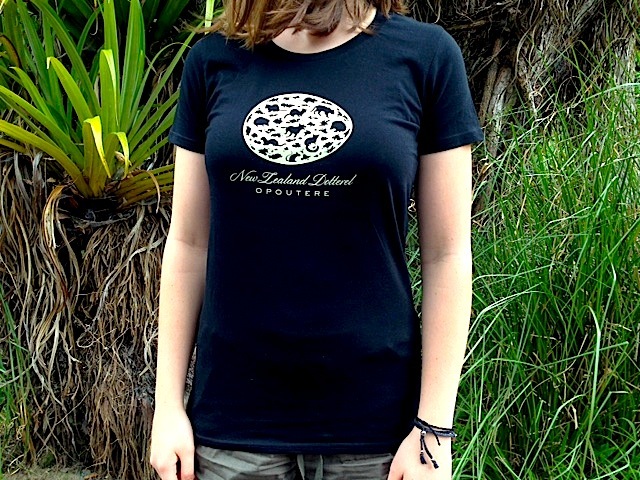 Rachel designed, procured and distributed the wonderful 2015 Opoutere t-shirts. The t-shirts are almost completely sold out with only a few kids’ shirts still available. The t-shirts raised just under $2000 this summer and it’s great to see so many people wearing them. The great Opoutere t-shirt tradition lives on! To view the latest news (including a tally of our pest victims!) from our Ecology Team visit the Pest Control page.